Your Headache is not my Problem. If your computer gets hacked and infected with malware that holds your data for ransom, just pay off the criminals to see your valuable data again and do not expect the FBI to save them – it's what the FBI is advising concerning ransomware. 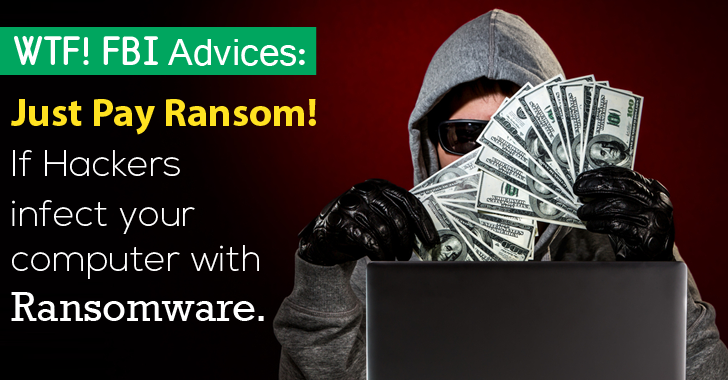 Ransomware is a sophisticated malicious software that lets hacker encrypts all the contents of a victim's hard drive or/and server and demands ransom (typically in Bitcoins) for the decrypt key. Federal agencies and the FBI have long urged people not to pay ransom to the criminals, as there is no guarantee that they will even receive an unlock key. However, while speaking at the 2015 Cyber Security Summit on Wednesday, Assistant Special Agent Joseph Bonavolonta, who oversees the FBI's Boston office, advised the companies infected with ransomware to better pay up the ransom, according to a recent report by Security Ledger. "The ransomware is that good," said Bonavolonta. "To be honest, we often advise people just to pay the ransom." So, is the FBI now sure that Paying Ransom would save the victim's data? Malicious programs such as Cryptolocker, Cryptowall, and Reveton uses "ultra secure" encryption algorithms to encrypt victims' data, and the key to decrypt data can cost victims from $200 to $10,000. However, even after paying this much of amount, there is no guarantee that victims will receive the key to recovering their data. Even the police are not immune to Ransomware attacks. Cryptowall – currently the most widespread malware used – alone made criminal hackers over 18 Million in dollars from April 2014 to June 2015. Due to the success of ransomware on such a vast scale, Bonavolonta said hackers are likely to keep their ransom demands low in an attempt to maximize profit. For this reason, they are mostly honest, he said, adding, "You do get your access back." This advice from the FBI agent counters many public advisories on the ransomware. Also, not everyone would agree with what Bonavolonta advised because fulfilling demands of bad guys is equivalent to encouraging their bad practices. As I previously recommended, the best defense measure against Ransomware is creating awareness within the organizations, as well as maintaining backups that are rotated regularly. Most viruses are introduced by opening infected attachments or clicking on links to malware usually contained in spam emails. So, DO NOT CLICK on links provided in emails and attachments from unknown sources. Moreover, ensure that your systems are running the latest version of Antivirus software with up to date malware definitions.